The Can Fan RK series of fans use the same motors and air flow control as the RS range. They are encased in a moulded durable polymer body. It's a matter of personal preference for the type of casing you require, but the polymer casing has allowed for addition of the RK-S and RK-W fans. The integrated electronic thermo sensor on these fans helps to control temperature. 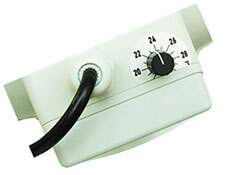 The target temperature is easily set by the adjustment dial. When a variation of more than one degree occurs, it activates an increase or decrease in the speed of the fan until the target temperature is achieved again. The addition of the speed controller adds versatility. Each speed setting is factory set and calibrated to produce the most efficient output specific to each fan. No need for extra electronic speed controllers or transformers. Flexibility when the grower needs to make seasonal adjustments. Convenience: increases the ability to match fans with a larger range of filters.